On the 16th of March, staff from Nittetsu Sumikin Bussan visited our feedlot to meet Kerwee and Stockyard staff, and to inspect the facility. 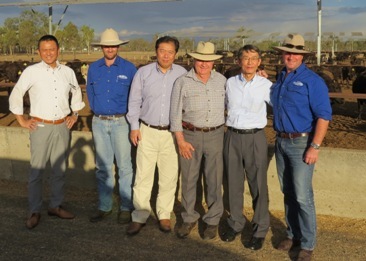 From left to right, Honmura-san, feedlot manager Brad Robinson, General Manager of Sumikin’s meat department Kobayashi-san, Stockyard chairman Robin Hart, Nittetsu Sumikin Bussan vice president Okada-san, and Stockyard CEO Lachie Hart. We were extremely happy to welcome Nittetsu Sumikin Bussan to Kerwee and look forward to their next visit.